Deep, age-defying hydration starts with Sacred Skin. Minimize the appearance of fine lines and wrinkles with L22 and IBR-Gapture, our revolutionary anti-aging and tightening powerhouses. Skin texture takes on a radiant glow with the added benefits of our exclusive Sacred Frankincense. Treat your skin to natural ingredients that provide intense, weightless hydration. L22-Engineered from botanically sourced lipids, L22® is designed to restore the skin surface to that of an average 22-year-old. PhytoCellTec Symphytum-Clinically proven to boost the regenerative capacity of epidermal skin cells, PhytoCellTec™ helps speed up skin renewal and slow the effects of aging. IBR-Gapture-A water extract of jojoba leaves, IBR-Gapture® works to improve cell cohesion, reduce water loss, diminish peeling and repair skin barriers. ProRenew Complex CLR-Tightening skin through probiotic technology, ProRenew Complex CLR™ works to refresh skin while protecting it from the environment. Apply to face and neck after cleansing with Radiance Cleansing Balm morning and night. I love the fresh scent and it leaves my skin soft. I add a drop of skin tone to my daily regimen also. I use Sacred Skin almost daily. I always use it after washing my face or whenever I'm feeling extra dry. It keeps my skin soft, and it smells great! I haven't really used it for very long but so far I love it and it smells great. I didn't know I liked this until I was out and had to use something else. It does give my face a softer appearance, I like the smell, and I feel moisturized and not greasy. I love this stuff. I wasn't able to afford it for for 5 months and didnt have any to use. I could tell such a difference in my skin when I use it and when I don't use it. Have been using it again for 2 weeks and can tell such a difference. my face is softer and smoother looking. I get compliment on how great my skin looks all the time. My all time favorite skin care product. Clean smelling,refreshing. Love it and the effects it has on my face. The smell is awesome too! I love this moisturizer. I add a couple drops of frankincense to it and apply to my face twice a day. At first I thought it might be too heavy, but it soaks into my skin completely. I will definitely be ordering it again. I received a free sample of Sacred Skin via RMO's Black Friday special. After a month of use I noticed that it helped to lightly fade my MANY age/sun spots. Also, Sacred Skin slightly helps to diminish the DEEP lines around my upper lip. I know it helps because i went without this product for a good month and the lines around my lip became more noticeable. Note: I apply Sacred Skin to my troubled areas 2x's daily (morning/evening) before applying my homemade facial cream. I would recommend this product to those with sun damaged skin. This moisturizer is so light, but it does the job well. I love the frankincense smell! This is by far the BEST moisturizer I have ever used! My skin has never been healthier or happier. It truly has improved the overall health of my skin. I really do love this skincare line! This is the first moisturizer I can wear under my makeup without it feeling greasy. I highly recommend Sacred Skin to anyone that has been struggling to find that perfect fit for their skin. Love this moisturizer. It makes my skin so soft and firm. The product has a wonderful smell, as well. I plan on using this for a long time to come. Spa experience with Sacred Skin! I absolutely love Sacred Skin Facial Moisurizer. It contains sacred frankincense which smells heavenly. The texture is slightly silky so spreads evenly. It is a light weight moisturizer, so in my opinion, could be used for all skin types. I have dry skin, and after using for 2 weeks now, my face seems to have a more even tone and glow...a little goes a long way..It's a bit pricey, but you can get it on sale...It need to order hand cream, as this keeps finding it's way into my purse..
Leaves my skin feeling well moisturized. I'm so happy to have a great moisturizer without all the harmful chemicals. I was dealing with very dry patches on my face this winter that I haven't had in years. I couldn't find anything that helped. Within a few days of using this moisturizer and the cleaner twice daily my dry patches had completely cleared up and now I am noticing my acne scars are fading and my skin is softer and brighter. I love that you don't need a lot of product, it goes on smooth and dries quickly. I have only been using the Tohi system for 2 weeks but I love it and can't wait to see what other magic it works on my skin! This lotion is unlike any I have ever tried before, including those recommended by my dermatologist. The texture, scent, and (most importantly) the results are fantastic. This may sound silly, but this lotion is truly a joy to use and I look forward to applying it every morning. I'm not kidding. I ordered this back in November hoping to solve some dry spots on my face. For whatever this product made it worse! I don't have any allergies so I was quite stumped and disappointed. I gave this item 5 starts though because when I contact Rocky Mountain to express my concerns I was issued a refund within 24 hours of my email - wow!! I've loved Rocky Mountain since I started using their oils a couple years ago and have recommended them to so many friends. This just reinforces why I love them. A company that has great products AND great customer service is not always easy to find! I received Sacred Skin with the set which included Night's Rest and Deep Radiance and this, by far in my opinion, is the nicest of the three. The aroma is heavenly, a very little goes a LONG way, and it feels wonderful on my face in Michigan and in the midst of a cold winter. It goes on heavier - even when using just a pea-sized amount - than other moisturizers I've used, so I'm not sure how that will feel in the summer, but right now I love it. The price seems quite high for the amount in the bottle, but I'm hoping that by only needing to use a very little at a time that this will last awhile. I love this product! I have severe rosacea on my face and this lotion has changed my world. I have never used anything that makes my face so clear, smooth, and happy. All without bad chemicals or medication. It's my little miracle in a bottle. I am a customer for life. I really like the sacred skin moisturizer. It feels like it absorbs right away and leaves my face feeling very soft. Frankincense is so good for the skin. I'm eager to see how it does in the long term to keep my skin healthy. I am 75 years old and I have always used good products for my face, hence I don't have many wrinkles. This sacred Skin is one of the best I have ever used. It is so smooth and makes my face feel like silk. I will certainly use it from now on, and I will tell others about it. I've been using the moisturizer for about two weeks now and I have completely stopped using my other moisturizer. I feel like the price point is in line with most other moisturizers that I have tried over the past couple of years and I love that it has sacred frankincense in it. I do wish that it contained Rose as well, but I will just keep mixing with my homemade serum. My skin has never felt better during the dry winter months. For reference, I have sensitive adult acne prone skin. I just tried my free sample. Wow. I am surprised by how impressed I am . I get tons of free samples of high end stuff from Sephora all the time so I get to try a lot of different products. When I first applied Sacred Skin it felt very creamy and I was afraid it was going to leave me with that greasy feeling that takes forever to absorb so I can put my make-up on. Much to my surprise with a minute my face was serious soft and smooth with no residual greasiness at all. And the smell is very organic from the natural Frankincense. I really like this stuff a lot. I’ve had a dry spot on my face that I’ve been working on for months now. It’s like it was dying for hydration and it wasn’t getting what it needed. I used Sacred Skin ONCE before bed and in the morning my spot was almost 100% Better. By use number two my dry spot was gone and my husband said he noticed a difference in the overall look of the skin. I have sensitive skin so I’m always nervous to try new skincare products but this one is a major hit! The scent can be a bit strong, especially with the first use, but by my third application I was completely used to it. I received a free sample in the mail with my recent order. I was reluctant to try it since I have always had sensitive dry skin. I'm SO glad I gave this a try. My skin has never felt so hydrated and smooth! I would have never tried this if I didn't receive a sample. I have very sensitive skin and have very limited options for skin care. I'm allergic to "fragrence mix" and have oral allergy syndrome so most things bother my lips or give me a rash. This did not irritate my skin and really hydrated my skin well. No irritation after 4 uses but sometimes it takes 2 weeks for me to react. Debating on taking the chance and getting the full bottle. Received a sample of the sacred skin mousturizer. The smell is intoxicating and my skin felt very soft all day. Cant wait to purchase. This really does make my skin softer and smoother, and I love the sacred frankincense. I do have wrinkles at 63 and at this point, tho only my first order, I don't know if they will lessen with time, but I think using Sacred Skin will set me up for slowing down the aging process some at least! The one complaint I have is the packaging. I am very conscious of environmental impact especially of our overuse of plastics and in my area (northern VA) this is not recyclable. Even if it was, I would much rather see this product sold in just a small simple jar (preferably glass) that can be either reused or recycled, or a squeeze tube.... Not nearly as fancy as the pump dispenser but may even bring the price down so more people could try this very nice product! Same goes with the facial cleanser. I like this moisturizer very much, both the consistency and the smell. However, the Sacred Frankincense -which I like - is strong, so it might be a problem for some people who don’t love pungent fragrances. Overall I think it’s one of the best moisturizers I have tried. I ordered Sacred Skin cream with a gift certificate. I really liked the way it went on at night, in the morning my skin was dewy and fresh looking. It appeared to make my pores look smaller and wrinkles were less noticeable. Overall I felt like my face looked fresh and younger, though by the end of the day my face seemed a little oilier than normal. The only thing I wasn't fond of was the smell, but it doesn't seem to linger long. After using this product for almost a month I will say that my skin feels really soft. It doesn't seem to do much for my wrinkles HOWEVER I also don't break out like crazy with it and my skin is so touchy that almost everything makes it break out. I'll keep using it even thought I still look wrinkly. There are MANY worse things in like than laugh lines and wrinkles from losing weight! This is by far one of the best moisturizers I have ever used and I absolutely love the scent!!! The ONLY complaint (if you even want to call it that) is that I wish the bottle had some type of "getting low" indicator (maybe a clear strip down the side, so you can see inside). I just ordered my third bottle and it is very frustrating to not know you are running out until the pump runs dry. The bottle is very lightweight and it doesn't really feel any different when it is empty, so there is just no way to know you need to reorder until you are scrambling for an alternative to hold you over until your shipment comes in. Again, the product itself is amazing!! And I love all of RMO products!! Been using for about a week...skin already looks brighter...still not sure if I like the smell?!?!? A sample of this moisturizer came in my recent order. I was hesitant to try it because I have sensitive skin and even natural products can bother me. I knew instantly this lotion was different. This moisturizer did not irritate, it left my skin soft, supple...absolutely no tightness and not a hint of irritation. I LOVED it and the only reason I give it 4 out of the 5 stars is because I cannot wear it in the day time (I need sunscreen in my day moisturizer) aside from that it is fabulous!!! Thank you RMO for another incredible product....just another reason to love RMO! Received a sample of this product with my essential oil purchase and I love it!! Face feels so good after applying. Although I wouldn't be able to use it in summer I live in a high humidity climate and this lotion is very creamy it would be a bit too greesy. But for winter it's perfect!! Smell is strong. Not my favorite. Very nice great on face love the sent ,but the reason for three stars, is to little quantity for a huge price. How many applications are in one container of sacred skin? BEST ANSWER: Two times a day will equal a 30 day supply. My Sacred Skin moisturizer lasted a couple months because I only apply Sacred to my troubled areas. What is the target age group for this new skincare line? BEST ANSWER: Our Tohi Skin Care Line is great for all skin types. The Sacred Skin Moisturizer is amazing for all skin but can be especially beneficial for mature skin. I'm 62 and it has helped to lighten my many age related (sun damage) dark spots. Still noticeable, yet, greatly lightened. Can I add a drop of essential oil to complement the frankincense already in the moisturiser before application? Whatever my mood may fancy at that point. You are welcome to add essential oils to the Sacred Skin Product. Is this suitable for acne proned skin and with large pores issues ? BEST ANSWER: Great question! 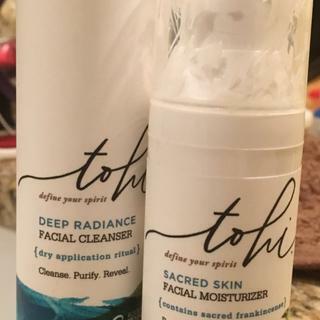 Our Tohi Sacred Skin Moisturizer can be used for all skin types. Is this vegan? Upon first glance, it appears to be- just making sure though! BEST ANSWER: Yes, this is Vegan. BEST ANSWER: Sorry, there is not any SPF in the Sacred Skin Moisturizer, all of the ingredients are listed on the back. The Sacred Skin Moisturizer was designed to Tone, Tighten and Hydrate your skin. Thankfully, no. The SPF/"no sun" recommendation of the past 25 years is right up there with "no fat," "no salt," and "no eggs." I haven't used sunscreen for the past ten years, and I am healthier and my skin looks younger than ever. This lotion is absolutely amazing, btw! Not advertised or promoted as such. Nothing on bottle that says it does. RMO should be able to answer. No. There is not but still my absolute favorite. Fades sunspots. I'm not seeing Frankincense in the ingredients? BEST ANSWER: The Sacred Skin product contains both the Boswellia Sacra (Sacred Frankincense) and the Boswellia Carterii (Frankincense Carterii). Sacred Frankincense is part of the ingredients in Sacred Skin. To find this information please look under "Facts" and it'll be under essential oils. Can this be applied around the eye areas? BEST ANSWER: Sacred Skin could definitely be applied around the eye socket or bony part of the eyes. However, be sure to avoid the eyes themselves. How can I get a free sample of this and the facial cleanser? BEST ANSWER: Unfortunately, we do not offer or sell samples. However, we do have a wonderful 90 day return policy. We are happy to provide our 90 Day No Hassle Return Policy and Satisfaction Guarantee. Our products can be returned for any reason, even if opened, for up to 90 days. A refund back to the original form of payment will be issued after the product is returned. BEST ANSWER: There is no gluten added to the product, however we are not certified gluten free. BEST ANSWER: For a better view of the ingredients list, please go to the direct product page and this information will be found under "ingredients". I was unable to find Walnuts in the product, however, we are unable to 100% guarantee that there would be no cross contamination as we are not certified allergen free. Walnuts and peanuts are not apart of the plants and are not used in our facility. Donât see any walnut listed. Will this help diminish the appearance of dark spots and skin discoloration? BEST ANSWER: Sacred Skin was mainly designed to minimize the appearance of fine lines and wrinkles. Sacred Skin has lightly faded many of my dark spots - still noticeable yet lighter in color. I also apply Sacred to my upper lip lines which are deep - still noticeable yet slightly diminished. Does this fell greasy when applied? BEST ANSWER: The Sacred Skin facial moisturizer absorbs into the skin very well. This causes it to not leave behind a greasy residue/feel. Someone asked about how long this product will last. The answer was using 2xs per day, it’s a 3 day supply? I am assuming they meant 3 month? BEST ANSWER: Sorry about that! There must have been a typo. The Tohi Skin Care products should last about 30 days with regular use (2 times a day). Are there any pthalates or parabens in this product? Can I use this product with rosacea? BEST ANSWER: If there are known skin conditions, we would suggest consulting with a professional before use. However, our Tohi Skin Care products are very gentle, natural and effective.